A great house doesn’t have just a great lawn of green grass, it also has well-trimmed hedges, beautifully painted exteriors and interiors, and great decorations inside and out. Black and Decker has ideas and tools for every single project that you could be working on. But some of their best tools are for the outside of the house, especially for maintaining your hedges. 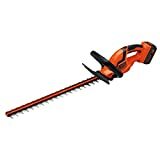 While many people still have and use traditional hedge clippers for maintaining their shrubs and bushes, Black and Decker has so many options to offer to more efficiently care for their hedges. It isn’t just because they’re a well-known name that you should consider using their tools to help make your lawn look impressive, it’s the history and dedication behind the brand that should make you consider them. Black and Decker has been revolutionizing power tools and home improvement since day one. The big name company started out with two young men in 1910. Their first claim to fame was the portable electric drill. They were making tools more flexible and also putting them in the hands of everyday people. In 1957, they started producing lawn and garden machinery that was portable, electric, and intended to be used by everyone. One of these tools was the electric hedge trimmer. Since time has gone on, the company has created some really amazing tools for everyday people to use around their homes. Since those first days in 1910, they have focused on helping their customers. Their machinery is created with the intent to help customers complete their projects efficiently. Besides the innovations to tools that they have made over the years, they have also dedicated themselves to the customers that are looking for help with a variety of projects. The company has articles and sections of the website that are dedicated to helping you make the most out of your house and lawn. Black and Decker has many different kinds of tools and as the years go on, they create more versions of those tools that fit a variety of different criteria. 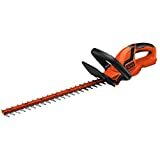 While there are so many different versions of the hedge trimmers, here are a couple of Black and Decker’s finest creations. It’ll be tough to pick which one is the best fit when there are so many great ones to pick from. This list is just a jumping off point, though. There are many more tools available, but these ones may help you start thinking about the kind of tool that you or a friend or loved one might need. The TR116 is the smallest of the models on this list, and it’s the cheapest. But that’s sometimes a great thing! This little thing certainly packs a punch even if it is a corded model of electric hedge trimmer. This means that you’ll spend less time fussing with rechargeable batteries and trying to lift a heavier version. The compact size shouldn’t fool you, though. This trimmer is still incredibly efficient with a 16-inch dual action blade. Because of its size, this model is perfect for someone that can’t lift heavy equipment or doesn’t have a ton of hedges that they need to maintain. Because it is also the cheapest, it could make a great present for anyone that does yard work regularly with normal shears and needs a little more time in the day. The HT22 is a slightly more powerful corded trimmer. This trimmer has a longer blade, 22 inches, and slightly more power behind it. It can cut through branches as thick as 3/4” in diameter. This tool is only slightly heavier than the TR116, but because it still doesn’t have a battery in it, that means that that extra weight is coming from parts that make the tool more efficient and sturdy. This model has a long enough blade to complete most jobs and because it doesn’t have a battery, it’s easy to use. You just plug in the machine and start going. Because it’s such a great machine, the biggest problem you’ll have is the amount of friends and family that want to borrow it for their own hedge trimming. The LHT2220 is a 22-inch hedge trimmer with a battery. What makes this different from the HT22, is that this machine will not be limited by the length of an extension cord for where it will go. The 20-volt battery has a battery life that should allow you to trim up to 3,000 square feet of hedge before you need to recharge the battery again. Unfortunately, the addition of the battery means that this trimmer is heavier than the HT22 at 5.9 pounds. This means that this machine may be a little too heavy for some people. But for those that have hedges in places that are hard to reach by a cord, this trimmer may be the perfect tool. Another plus is that when you purchase this trimmer through Black and Decker, they include the charger that you will need for this battery. This last model is the most powerful of the bunch. It comes with 40-volt lithium ion battery that will last twice as long as the 20 volt that the LHT2220 has. It also has a 24-inch blade that is the longest of the bunch. Again, Black and Decker has included the charger that you need for the battery that is included with their product. This hedge trimmer is the heaviest of the bunch, coming up on almost 7 pounds. Coupled with the fact that this trimmer can trim 6,000 square feet of hedge per battery charge, this trimmer proves that is ready to do almost every job. However, this trimmer is definitely not for those that have issues carrying heavy machinery. This would be suitable for someone that has a lot of hedges and doesn’t mind lifting this trimmer for a while. Even if it is heavy, it gets the work done quickly on almost every project. Obviously, each tool has their own pros and cons. The TR116 and the HT22 are the lightest ones, but they both need to be plugged in to work. The LHT2220 and the LHT2436 don’t need cords, but they’re the heavier ones. What really makes all of these tools great is the brand behind them. Because Black and Decker is dedicated to their customers, the tools that they make reflect that. These tools are made to last. And if they don’t, then having a warranty for the normal wear and tear will get you far. And if something strange and unusual happens, then Black and Decker will be sure to quickly deal with the situation and help you through the process. Black and Decker wants to see you improving your home, and they’ll be there for you almost every step of the way. Black and Decker has dedicated themselves to providing tools that fit a wide range of people. That’s certainly true with even just the small selection that is here for you to see. They have tools that fit a variety of projects, a variety of people, and a variety of budgets. If you looking for a tool to get the job done, Black and Decker is certain to have a tool that will fit your unique situation and life.